We certainly don’t watch as much college basketball as we used to back in the day when we actually had time, so we’re not here to tell anyone who the Cleveland Cavaliers should select with the fourth pick in the upcoming draft. 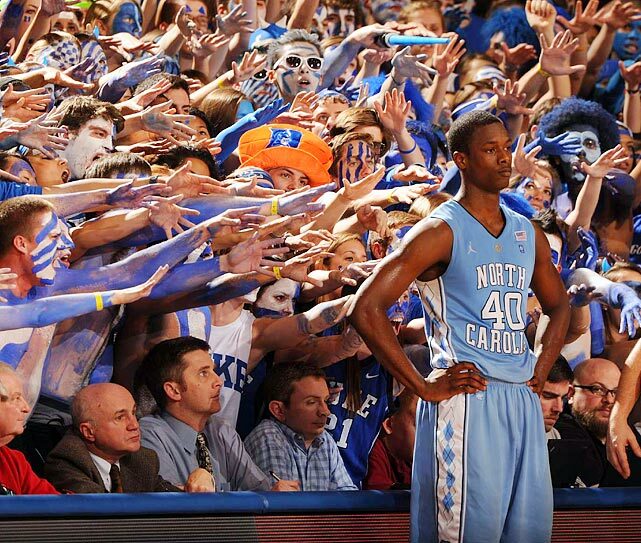 But this we do know: under no circumstance should they draft North Carolina’s Harrison Barnes. When I was asked to do a blurb about the three worst possible destinations for Harrison Barnes, a.k.a. “The Black Falcon,” a.k.a. “The Most Overrated College Basketball Player in History,” my initial thought was, “a room without mirrors, a humility convention, and the induction ceremony at the top-secret Two Coreys Club for failed child stars.” But this is a lottery post, so I’m guessing he meant the three worst teams. Fair enough, because I have the perfect answer. But before that, I have to revisit the (somewhat biased) highlights of Barnes’s two years at North Carolina. Became the first ever freshman preseason All-American. Really digest that one. Consider everyone who has ever played college basketball, and consider that of that group, only Barnes earned this recognition. That’s why I’m completely comfortable calling him the most overrated player in history. Disappointed everyone, did not earn even third-team All-American status. Disappointed everyone, did not earn even third-team All-American status. Was, in fact, the fourth-best player on his own team. Obessed about his “brand” and even designed a Black Falcon logo. FOR HIMSELF, presumably. You see the pattern? Barnes masters the hype machine, suckers everyone in, and then can’t live up to it. So, what’s the worst possible scenario for Barnes? Or the best, if you want to see him fail? Easy. Of the 1,000 lottery Ping-Pong balls, one of Charlotte’s 998 is plucked first. The ‘Cats get the coveted pick, but instead of making the obvious choice with Anthony Davis, Michael Jordan comes out publicly and says that Harrison Barnes is the next … well, him. They nab Barnes, who remains in North Carolina among the hordes of Charlotte-based UNC fans he’s already been burned twice. The hype escalates, and then Barnes does what Barnes does best — mediocrity in the face of promised greatness. Like we said, we don’t follow college basketball as much as some people do, but if even 10 percent of what Ryan wrote is true, the Cavs should run as far away as possible. The first is, if you are a dog at one of the biggest college programs, why would you not be a dog once you started cashing a big paycheck? Second, we refuse to believe there are not at least four NBA-caliber players in the upcoming draft class. Sure it would have been great if the Cavs had landed the No. 1 pick and the opportunity to select Kentucky’s Anthony Davis. But that doesn’t mean the Cavs are doomed to mediocrity forever and a day. If they do there homework, there is no way they walk out of the draft without selecting a very good player at No. 4. Above all, they need to select the player that best fits in with the team and what they want to accomplish. It is beyond irrelevant what the “experts” say; the Cavs just need to do what is best for them. And drafting Barnes is not in the team’s best interests.